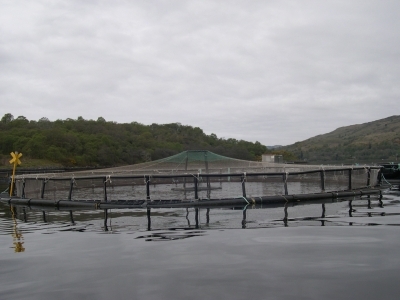 It is very unfortunate that salmon is often perceived as being an expensive fish to buy fresh. Canned salmon does not even begin to afford the flavours or health benefits afforded by fresh salmon and to enjoy salmon at its best, it is imperative to buy the fish fresh. A little bit of time spent looking in supermarkets or in fishmongers is likely to reveal that fresh salmon is perhaps not as expensive as you first think and can be purchased at least occasionally on the most modest of budgets. 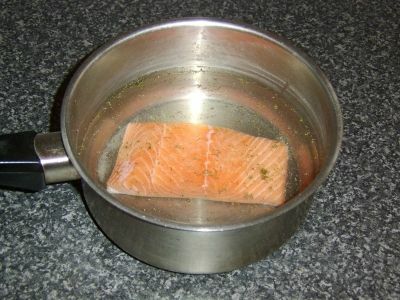 When you are cooking fresh salmon, it is of vital importance that you do not overcook it. Canned salmon is the perfect example of where the fish has been overcooked, drying it out, spoiling the flavour and negating most if not all of the health benefits. 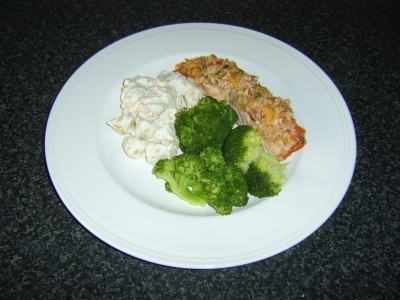 This page is therefore dedicated to showing you how to cook fresh salmon to perfection and providing a variety of tasty, healthy salmon recipes for you to sample and hopefully enjoy, just like the citrus and herb baked salmon fillet pictured. 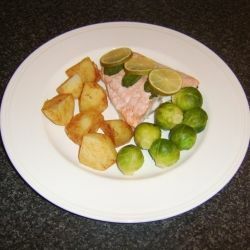 The salmon used in the recipes on this page is from Scotland. Salmon is not the only fish however found in abundance in the cold, clear waters of and around Scotland. This new e-book celebrates the gift of abundant fish and seafood Scotland enjoys and explores new and innovative ways of cooking it to perfection. Why not download your bargain copy today and get cooking tomorrow? 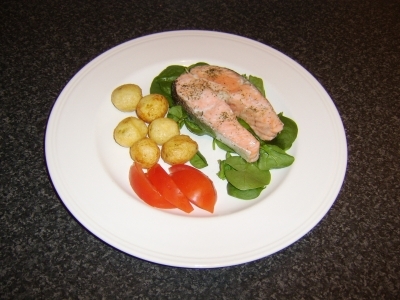 A majority of people will buy fresh salmon in either steak or loin fillet form. When choosing fresh salmon, try to ensure it is as fresh as possible. The flesh should be firm to the touch and it should not have an overly fish-like smell. Ideally, your fishmonger will already have scaled the fish for you and, in the case of loin fillets, removed all of the bones. There may, however, be some of the small pin bones remaining and it is best to carefully remove these prior to cooking the salmon. To check for them, rub your fingers over the flesh of the fish, against the grain. If you can feel any remaining small bones, remove them with a pair of tweezers, careful not to demage the flesh of the fish. It is very important to remember when poaching salmon that submitting it to a long period of time in boiling water will destroy or remove a lot of the nutritional benefits from the fish. That is why this salmon fillet is poached largely in what amounts only to residual heat and will be served deliciously moist, with its natural oils and goodness intact. 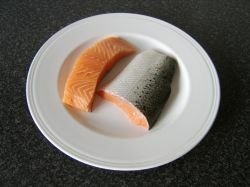 Place your salmon fillet in to a pot and season with salt, white pepper and the dried dill. Add enough cold water to cover the fillet. Put the pot on a high heat until the water boils. Turn off the heat, remove the pot from the heat source and put the lid on. Leave the salmon to cook in the cooling liquer for at least an hour. The hard boiled egg in this recipe is also served cold. In order to avoid the unpleasant blue/grey border around the yolk, cook the egg about an hour in advance of service, using the following, precise method. Make sure the egg is at room temperature and not straight out of the refrigerator. If you do keep your eggs in the fridge, take it out at least two hours before you are going to boil it. Add the egg to a small pot and add enough cold water to comfortably cover the egg. Put on a high heat until the water begins to boil then reduce the heat and simmer for six minutes. Put the pot in to the sink and run cold water in to it. After twenty seconds or so, the egg should be cool enough to handle. Carefully crack it all around on a hard surface and peel the shell off under running cold water. Submerge the peeled egg in cold water for at least half an hour to cool it quickly. This method of hard boiling an egg prevents the blue-grey tinge. Bruschetta is a delicious way of serving bread and can very effectively be made from leftover bread, as it indeed was originally. 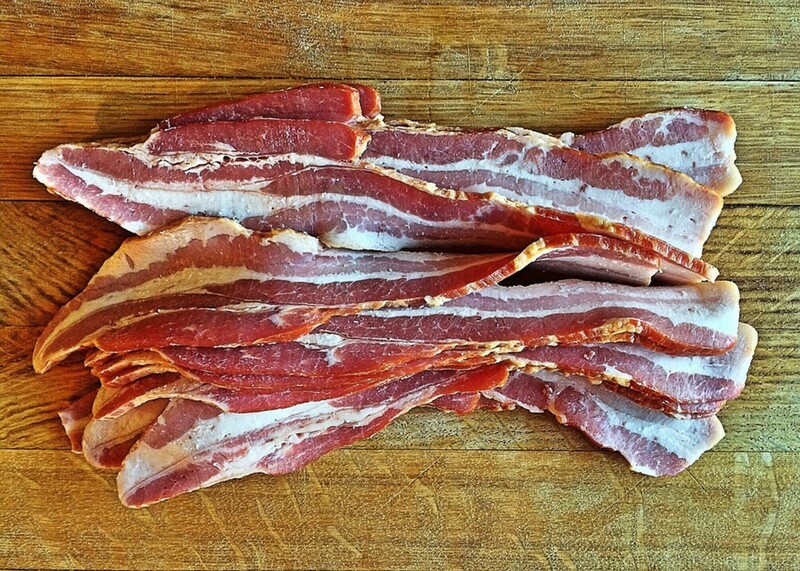 Toast the slices of bread on both sides under an overhead grill or even on a griddle. While the bread is toasting, peel and lightly crush the garlic clove to release the juices. Wipe the garlic clove over the hot toasted bread and the heat will help it to soak up the juices. Drizzle the toast with extra virgin olive oil and season with salt and black pepper. Lay the rocket/arugula on the serving plate. 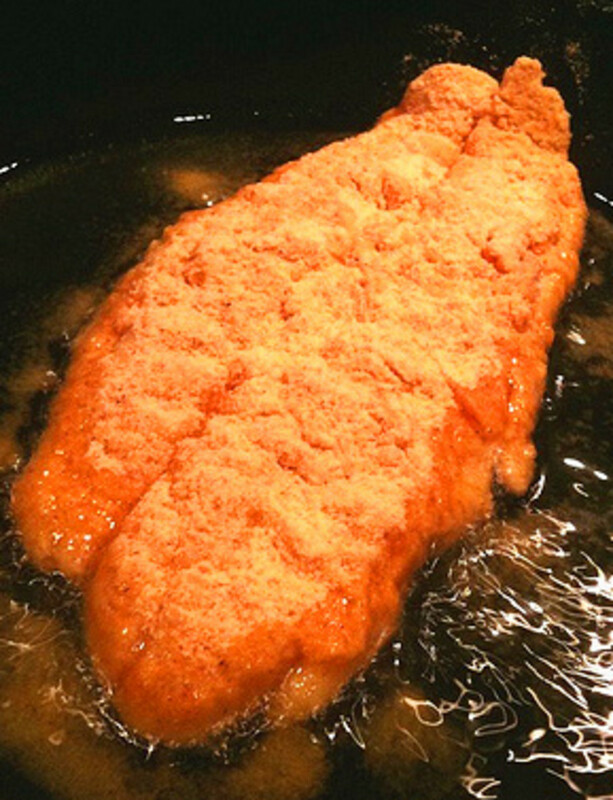 Using a fish slice, lift the salmon fillet from the cool liquid and lay it on top. Dry the egg with paper towel and half it down through the centre before plating either side of the salmon. Add the bruschetta and serve immediately. Like the Salmon Recipes Featured on this Page? Horseradish sauce is unquestionably more often associated with beef than salmon. If you have not tried this combination, however, you may be in for a very pleasant surprise as salmon and horseradish sauce go extremely well together. Note also that this recipe is for salmon steamed and not poached, which is why there is very little wine used in the recipe, leaving plenty in the bottle to be chilled and consumed with the served meal. Wash the potatoes but don't peel them before adding them to a pot of cold, slightly salted water. Bring to a boil and simmer for thirty to thirty-five minutes until soft. Lightly oil the skin side of the salmon to prevent it sticking. Place it on a large sheet of foil in a baking tray. Season with salt, white pepper and the dried dill. 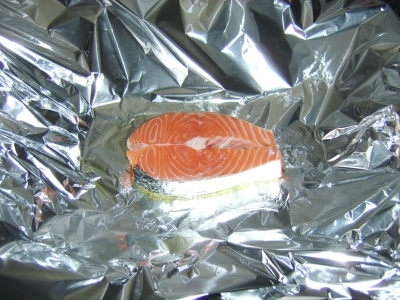 Drizzle the white wine over the top before folding the foil in to a loose but sealed tent. This will allow the wine to turn to steam and cook the salmon. Place in to an oven preheated to 375F/190C for 12 to 15 minutes. The frozen peas should be added to a pot of boiling water for three minutes. Drain the potatoes and return them to the empty pot. Add the butter and the remaining dill. Swirl the potatoes gently around to ensure even coating. Be very careful of escaping steam when unwrapping the salmon. 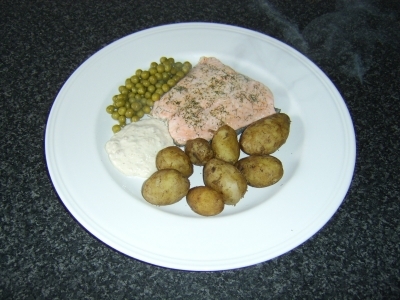 Plate the salmon and the potatoes, followed by the drained peas. Spoon on the horseradish sauce and serve. The potato salad will require to be made first. Place the unpeeled potatoes in to a pot of cold water, bring the water to a boil and simmer for thirty to thirty-five minutes until the potatoes are soft. Drain and submerge in a bowl of cold water for a minimum of half an hour to cool them quickly. Drain the potatoes and rub the skin off them with the ball of your thumb. Half or quarter the potatoes and place them in a clean bowl with the mayonnaise and sweetcorn. 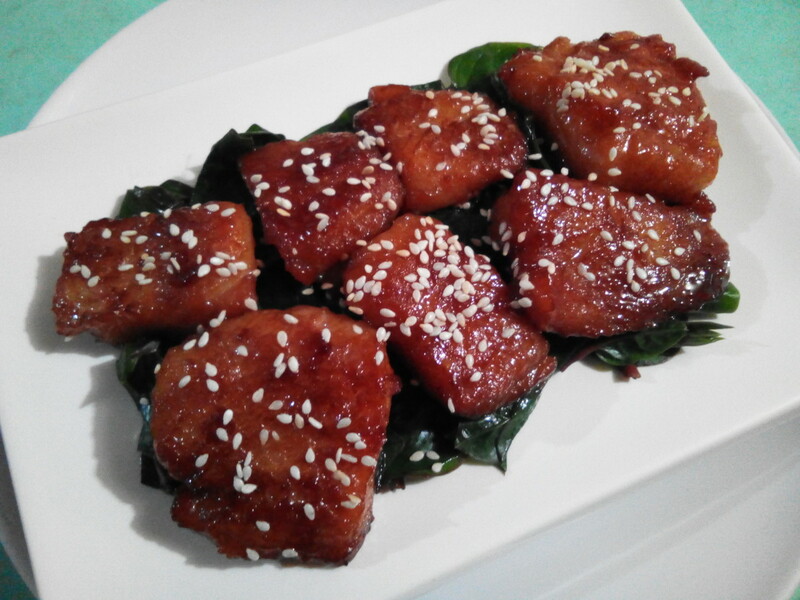 Season with salt and white pepper, mix carefully but well. Cover with plastic film and refrigerate until required. Break the broccoli in to florets and submerge in boiling, slightly salted water. Simmer for eight minutes only. Drain well. Pat the skin side of the salmon in seasoned flour. 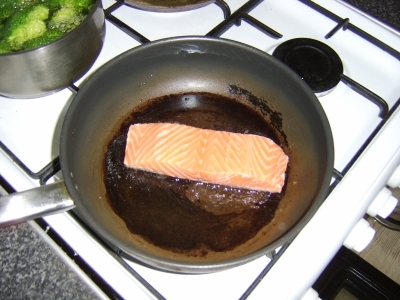 Bring some sunflower oil up to a medium heat in a non-stick frying pan and add the salmon fillet, skin side down. Cook on a medium heat until the salmon can be seen from the side to have cooked a little more than half way through. Turn the fillet and switch the heat off. Mix the cheese, breadcrumbs, tomato and torn basil leaves. Carefully peel the crisp skin off the salmon with - if necessary - the aid of a blunt knife. Use the mix to cover the salmon fillet. Don't worry about spillage as it will not affect presentation. Place the frying pan under a preheated, hot overhead grill until the cheese mix forms a crisp coating. Plate the component parts of the meal and serve immediately. This recipe is actually just a variation of the one featured immediately above. 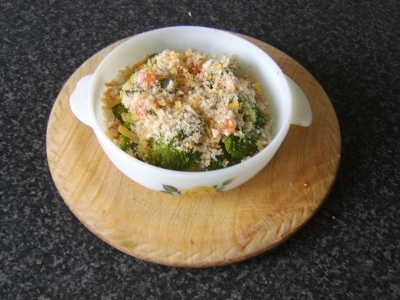 Instead of adding the cheese and breadcrumbs to the salmon, the mix is instead used on some poached broccoli and affords a different way of eating broccoli, perhaps for those who are not usually so keen on this most delicious and nutritious of vegetables. Peel the potatoes, chop and add to a large pot of cold, salted water. Bring to a boil and simmer for twenty-five minutes or until soft. Wash the broccoli and break it carefully in to florets. Add to slightly salted, boiling water and cook for seven to eight minutes - no longer. Pat the salmon in seasoned flour on the skin side only. Add sunflower oil to a pan and bring up to a fairly high heat. 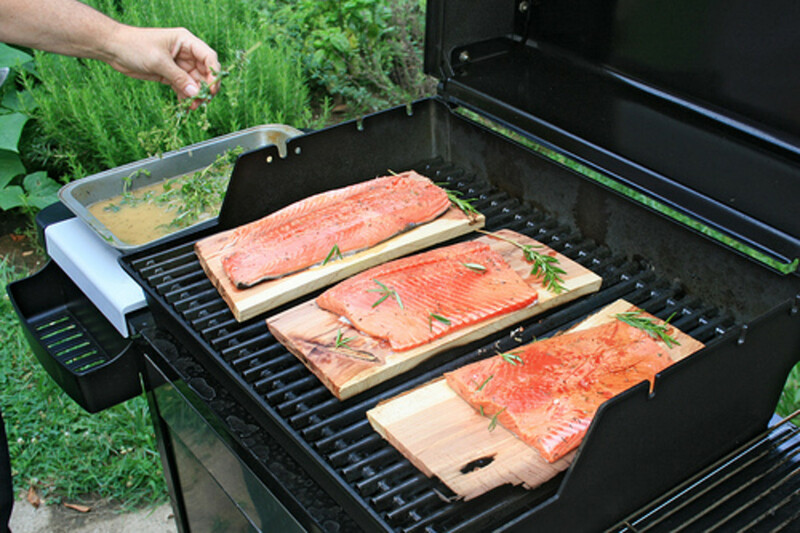 Add the salmon on the skin side, season and cook until it can be seen from the side to have cooked slightly more than halfway through. Turn the fillet and switch the heat off. 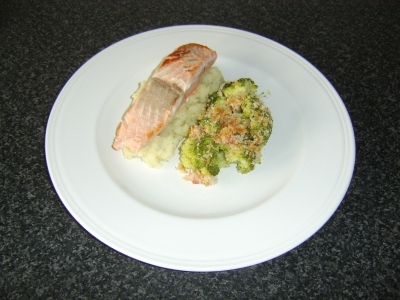 The salmon fillet will complete cooking in the residual heat while the finishing touches are put to the broccoli and mash. Drain the broccoli well and place it in to a small, oven proof dish. Scatter the breadcrumb mix over the top. Note that more mix than this can be used if desired but the idea is to simply add a little extra flavour to the broccoli and not overwhelm it. Place the dish under a hot, overhead grill for a couple of minutes to brown the breadcrumbs and melt the cheese. Drain the potatoes and mash with a little butter, the peeled and grated garlic clove and the dried dill. Plate the mash and carefully lift the skin away from the salmon fillet before laying it on top. Add the broccoli alongside and serve. 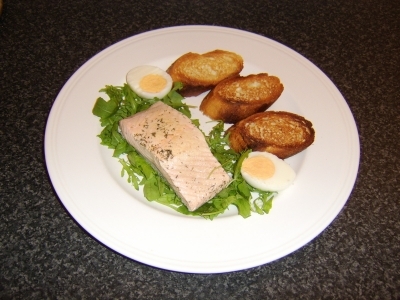 This recipe is for a cross-section slice of a large salmon, the bone and skin still in place. Care should be taken to remove the bones prior to eating the salmon. Wash but don't peel the potatoes. Put them in a large pot with enough cold water to comfortably cover them and season with salt. Bring to a boil and reduce heat to simmer for thirty minutes. Drain and add the potatoes to a bowl of cold water for at least fifteen minutes to cool them quickly. Preheat oven to 375F/190C. Very lightly oil a large sheet of tinfoil to prevent the salmon sticking. Lay the salmon on the foil and season with salt, white pepper and the dried dill. 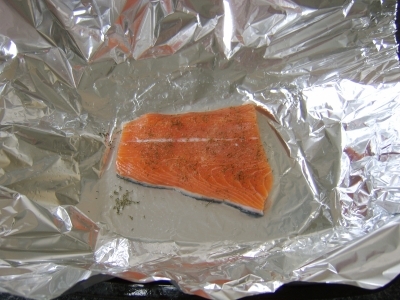 Wrap the salmon in to a sealed package and place on a baking tray. Put in the oven for twelve minutes. Drain the potatoes again and rub the skins off with your thumb. Dry the potatoes in a clean tea towel, carefully so as not to damage them, before deep frying for five or six minutes until crisp and golden. Lay the spinach leaves on the serving plate. Remove the salmon from the oven, unwrap it (careful of escaping steam) and lay it on top of the spinach. Drain the potatoes on kitchen paper and lay them alongside the salmon with the sliced tomato. Thank you for your visit to this page and I hope that you have found it useful and informative. Any feedback or comments which you have may be left in the space below. 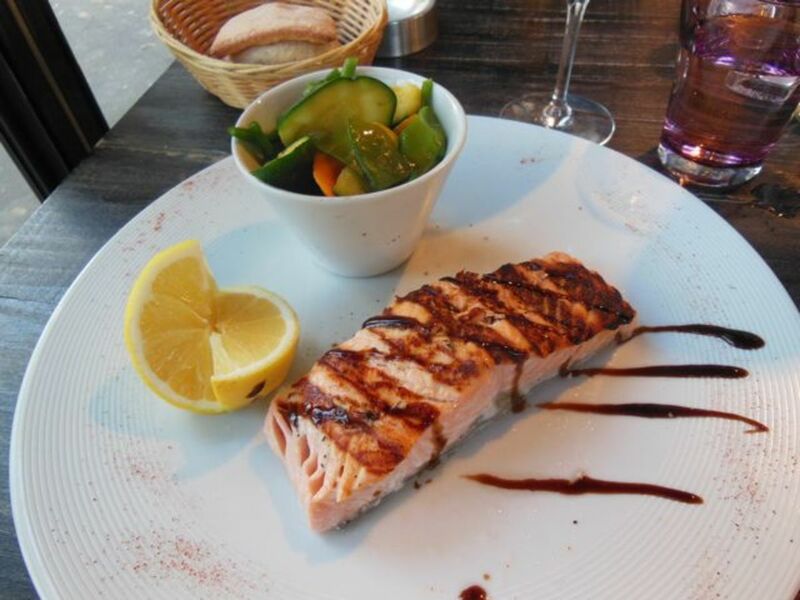 How do you Like your Salmon Cooked? - Has your chosen method been covered on this page? Try these salmon recipes too. Wow - these all look awesome! Can't decide which won to try first. Bruschetta one, I think... Thanks for all these amazing ideas. This is a great lens on Healthy Salmon Recipes and How to Cook Salmon.